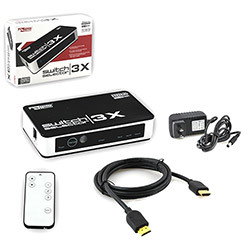 The Switch Selector 3X allows you to hook up to three different HDMI compatible devices to a single HDMI port! Simply plug your HDMI units to the Switch Selector 3X and connect to you HDTV or receiver. Whether you have a Blue-ray disc player, PlayStation 3, Xbox 360, HD cable TV, or other hi-def device, use the remote control (included) to instantly switch signals. Its the perfect accessory to minimize cable clutter and save space!